“I think it's very important to do this, and we are very lucky to have been able to do so,” Andreas Skytt Larsen tells me after showing up at my Brooklyn front door without much more than a backpack. He’s traveled 3,600 miles from Denmark to pour his beer on U.S. soil for only the third time. Beer festivals ain’t cheap. They’re not cheap to put on. And they’re not cheap for brewers to attend, especially when you’re a tiny beer maker who has to travel halfway across the world for the event. 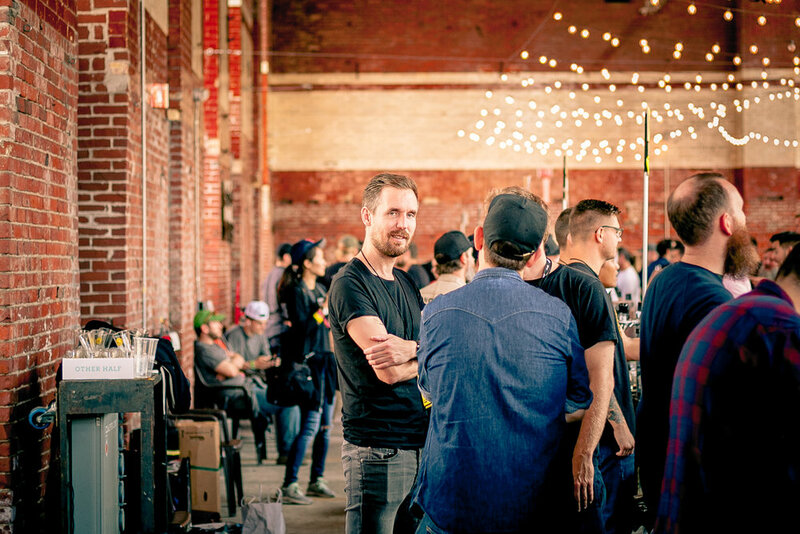 But when the festival is hosted by Mikkeller founder Mikkel Borg Bjergsø, a fellow Dane and early supporter, and affords you the opportunity to pour for a bunch of eager American drinkers that are always looking for the next best thing no one’s tried yet, well, you figure out how to make it work. The new brewery and brewhouse is currently in the works, and the jump is substantial, bumping production to 20 hectoliters (about 17 BBLs). 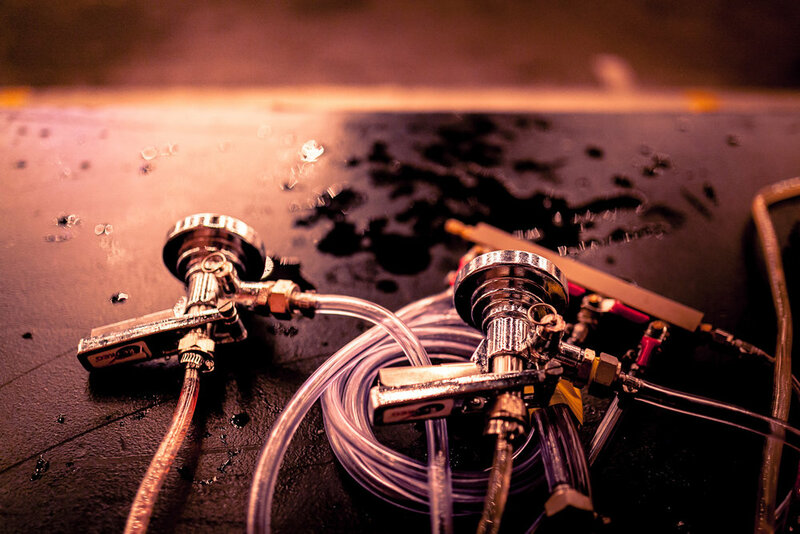 Up to this point, Alefarm has almost immediately sold through all the beer they produce, but Larsen envisions the new system affording something a bit more like what we encounter at breweries here in the States. 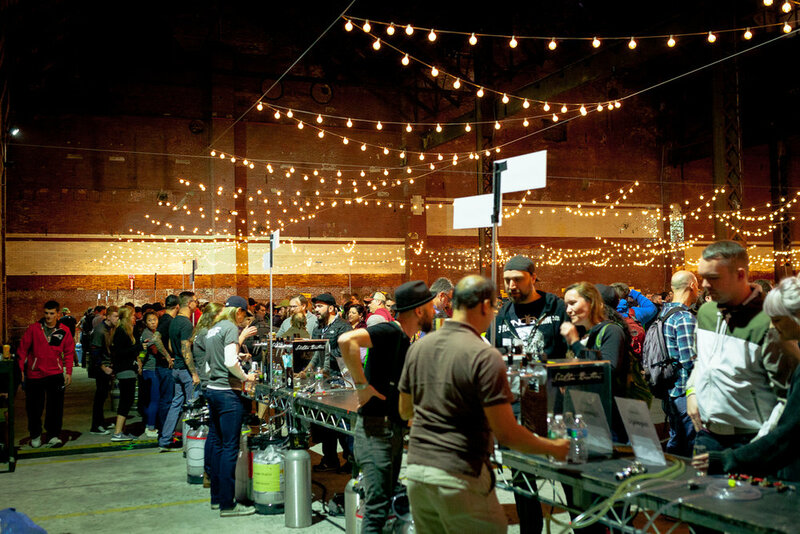 This is Alefarm’s second time attending Copenhagen Beer Celebration Boston. They’ve also attended Hunahpu Day in Florida. Larsen laments the fact that they’ve had to say no to some. The brewery, after all, is tiny. Larsen decides to maximize his time in the States, arranging a full week of collaborations leading up to the festival. 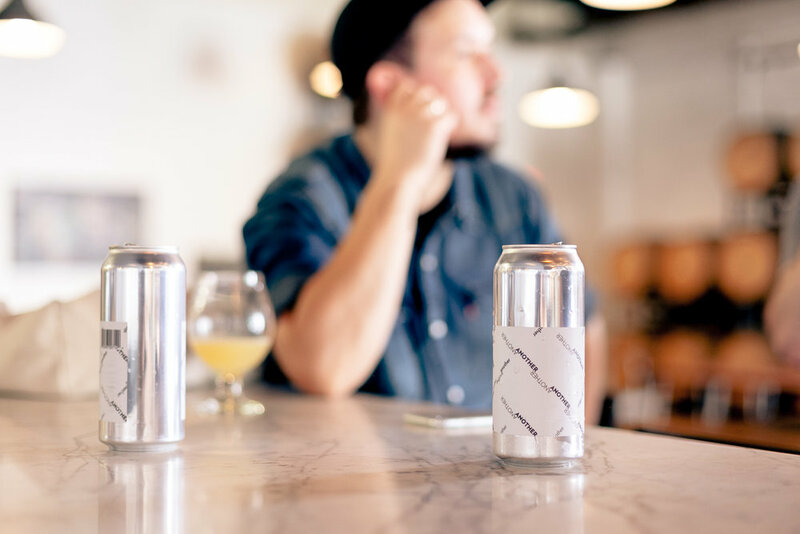 Each day is designated to a brewery—Other Half, Threes, Forest & Main, Finback, and Night Shift. Five days, five collaborations. It’s efficient, effective, and grueling. Not bad for a guy who was a librarian-turned-homebrewer just three years previous. 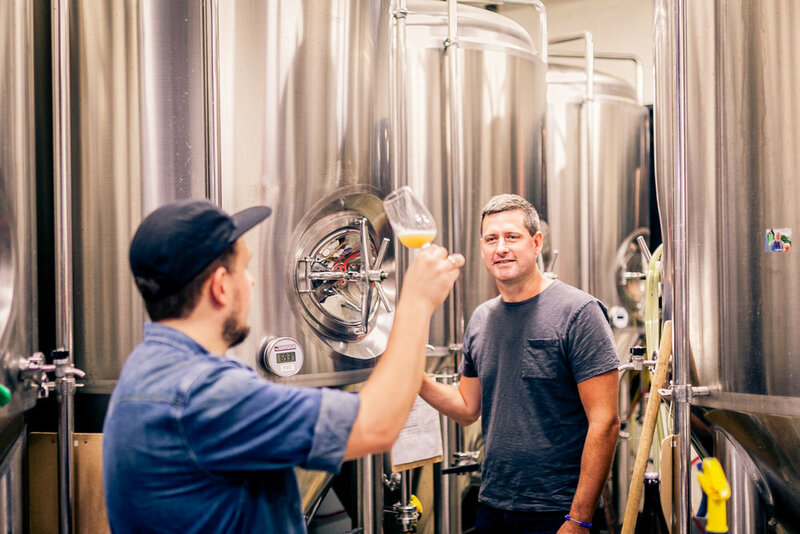 In Denmark, Alefarm focuses on Sour Saisons and Farmhouse Ales, as well as Pale Ales and IPAs. 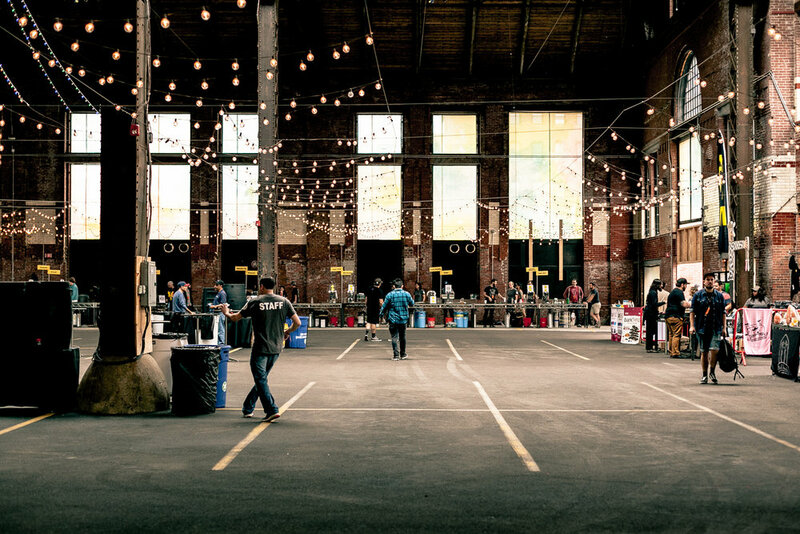 Which is to say: their beer is a perfect fit for a U.S. festival. GBH tags along with Larsen on part of his trip to see just what it’s like to be a brewer thousands of miles from home. We begin with a collaboration at Finback in New York City and conclude with three festival sessions up in Boston. Larsen and Ford Dodd—a long-time friend of the brewery who lends a helping hand whenever Alefarm needs it—head north on 4th Avenue in Park Slope, Brooklyn. Dodd made the drive up from North Carolina earlier in the week. He oozes bearded, Southern charm, and if you get him going about his homemade BBQ sauce recipe, you’ll need to find a comfortable spot to sit back and listen. We’re on our way to grab some necessities from their car and pay a quick visit to Threes Brewing. Head brewer Greg Doroski invites us in to check in on the beer they brewed Tuesday morning. He holds it up to the light, inspects it, takes a sip and a smile sneaks across his face. We hop in a car headed out to Queens. 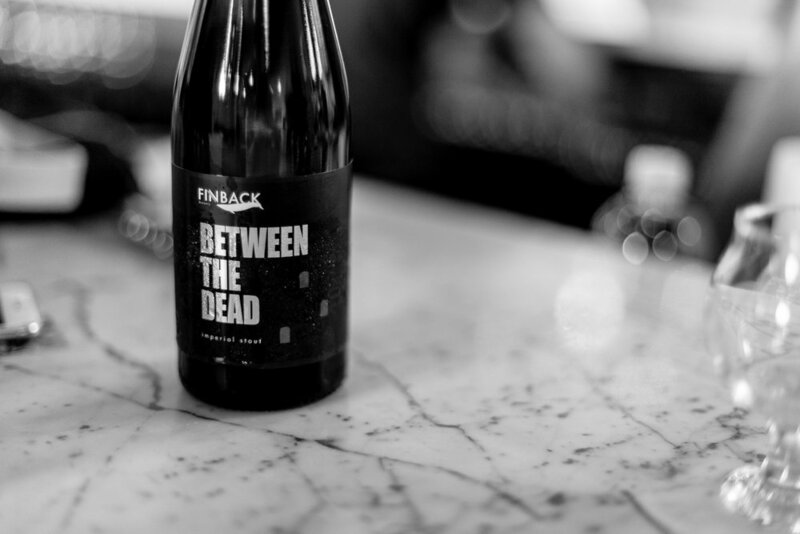 Next stop: Finback. We're running a little behind schedule. Kevin Stafford, owner and head brewer of Finback has been pulled over. Thankfully, just a minor violation: failure to stop. 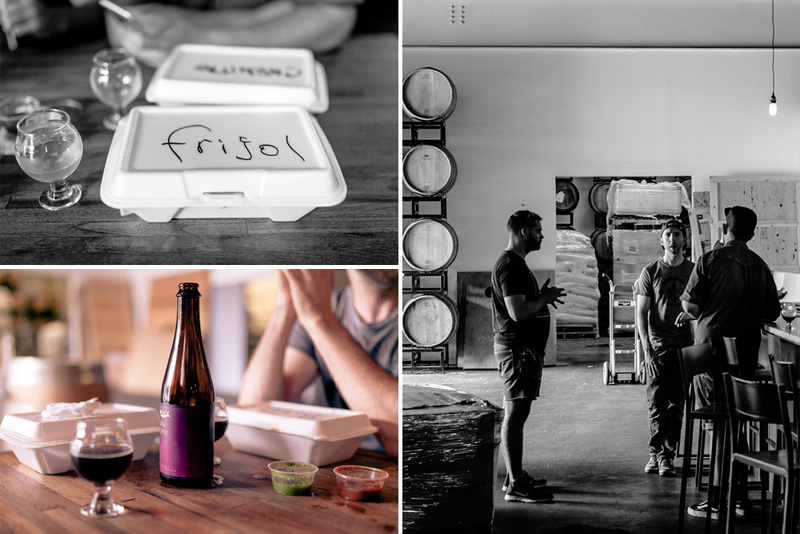 Stafford, who’s the more reserved of the two owners, providing a foil to the more gregarious nature of his partner Basil Lee, welcomes us to the brewery and shows us around. We wind from room to room and it occurs to me that Finback is massive by NYC standards. They’ve just installed a permanent canning line and Larsen is eager to check it out, having just purchased one for his new brewery currently being built back in Denmark. They’ve finished their new double IPA, which will be called Whalefarm, a nod to Finback’s marine animal themes combined with, well, Alefarm. So we head to the taproom to try some beers. Stafford works his way through a few of the tap handles jutting out from a long slab of marble. Over a mix of IPAs, the two brewers get to know one another better, talking about their respective businesses. Stafford talks about their early days, when they were Narwhal Brewery but had to change due to trademark issues with Sierra Nevada. The important business of ordering tacos begins. Having been to Copenhagen a number of times now, I chat with Larsen about eating at Hija de Sanchez, the renowned Mexican joint operated by ex-Noma pastry chef Rosio Sanchez. To me, it's the only logical way he would know to order a beef tongue taco, his favorite. “Have you ever had Yuca Taco in Copenhagen?” he asks. I haven’t, which leads him to describe a roving, robin egg blue Volkswagen Camper Van selling authentic, Yucatán tacos. My mouth waters. Sam Shire, assistant brewer at Finback, begins pouring a few samples of new IPAs for us to try: Clearing, brewed with chamomile, and Origin, a new Double IPA. Next up, he cracks a bottle of Between the Dead Imperial Stout, a massive beer with coconut and aged in bourbon barrels. Before we know it, the bar area is littered with cans, glasses, and beers of all shades. It’s going to be a long day. 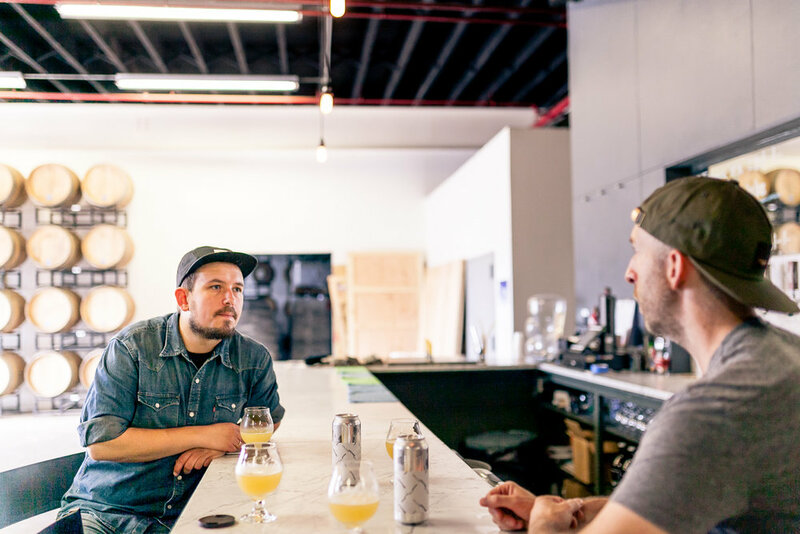 We wrap up at Finback and catch a ride to Brouwerij Lane, a craft bar in Greenpoint, Brooklyn, to have some beers with GM and beer buyer Kim Mercado. Kim is old friends with Larsen, having met him when she lived in Copenhagen for a few months. She and her dog, Olivia Benson—named after detective Olivia Benson on Law & Order: SVU, of course—happily greet us and beers are poured immediately, Hill Farmstead and Suarez filling glasses. We saddle up near the open window at the front, soaking in both the weather and beers. Mercado is known for springing Underbergs on people. It’s become Mercado’s signature move of sorts, and she doesn’t disappoint today, lining up bottles wrapped in their tell-tale brown paper. We bump into Kaitlyn LeLoup, a rep for Long Island City Beer Project, who invites us over to try some beers. 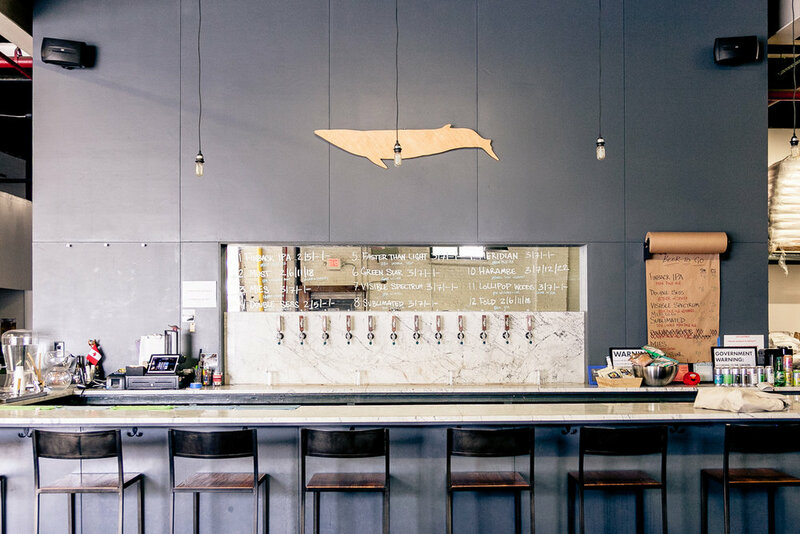 The day’s turning into a brewery crawl, and that’s perfectly fine with Larsen. A short ride later, we’re standing in the steamy brewhouse, opening bottles of LICBP’s Key Lime Berliner and a few of their spontaneously fermented offerings. Oh, and it’s trivia night, so we create our team (named Whalefarm, of course), sign up, and jump in. An hour or so later, after rounds of questions about ‘90s sitcoms, city-themed song titles, and current events, we emerge victorious. 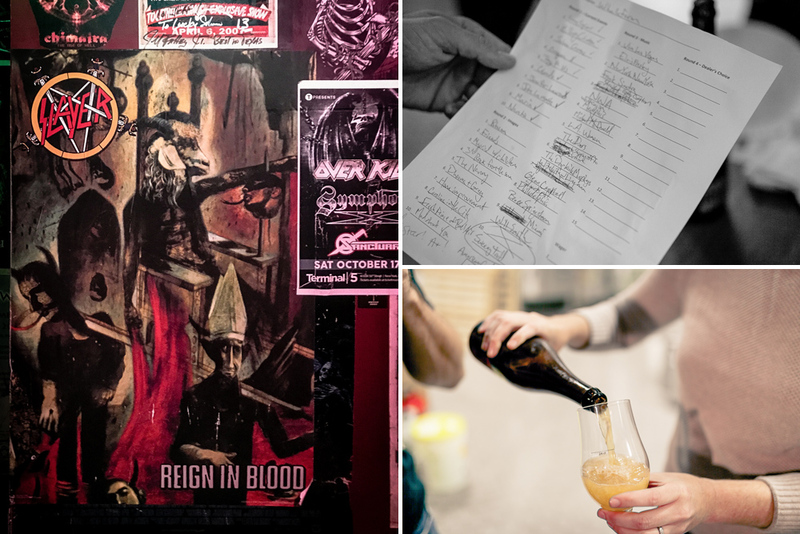 We’re in a car on the BQE somewhere between Williamsburg and downtown Brooklyn when Finback’s Stafford texts a photo of Slayer’s Reign in Blood cover art. Oh, right, we told him we’d meet up with him at a metal bar near my place. We decide it’s best to call it a night instead. We’ve got traveling to do in the morning. Long Island Rail to Airtrain to Federal Circle to the rental car area. I’ve made this exact trek too many times to count, and it’s one of my least favorite itineraries. Thankfully, before we know it, we’re on the Whitestone Bridge, then crossing into Greenwich just across the Connecticut state line—Boston-bound. Larsen and Dodd were out before us so they could get to Night Shift for Alefarm’s fifth, and last, collaboration, a 7% IPA utilizing oats and lupulin powder. They needed to be on the road by 6am, so maybe my trip this morning wasn’t so bad after all. After checking into the hotel and a quick lunch, I connect with Larsen in front of the SoWa Power Station where the festival is being held. We get credentials and slither through the crowd gathering at the main entrance. The hall is large and immediately seems a better venue than last year’s outdoor setting. It was built in 1896 and was, at the time, the world’s largest electric power generation plant. Inside it’s massively cavernous. String lights droop in arced shapes from rafters. Brewery booths hug the perimeter affording a large, open area in the center. We locate the Alefarm booth and start setting up by filling out the stickers with beer names. Session one, the Rød Session (each one is named after a Danish color), is about to begin. After greeting festival goers and pouring taster glasses of Bloesem, a barrel-fermented Saison with sour cherries and elderflower, as well as Shadows & Silhouettes, a dry-hopped Sour Saison, Larsen and I decide to walk the floor. Matt Tarpey from The Veil greets us with a Double IPA. At the Bokkereyder booth, we enjoy some Framboos Vanille, a two-year-old pinot noir barrel-aged Lambic with fresh Pajottenland raspberries. We eventually stop by to talk with Todd Boera of Fonta Flora. “I think he's the nicest guy on the planet,” Larsen says. The two discuss utilizing spent fruit in a beer as Boera offers us pours of Local Snacks, a wild ale that does just that. 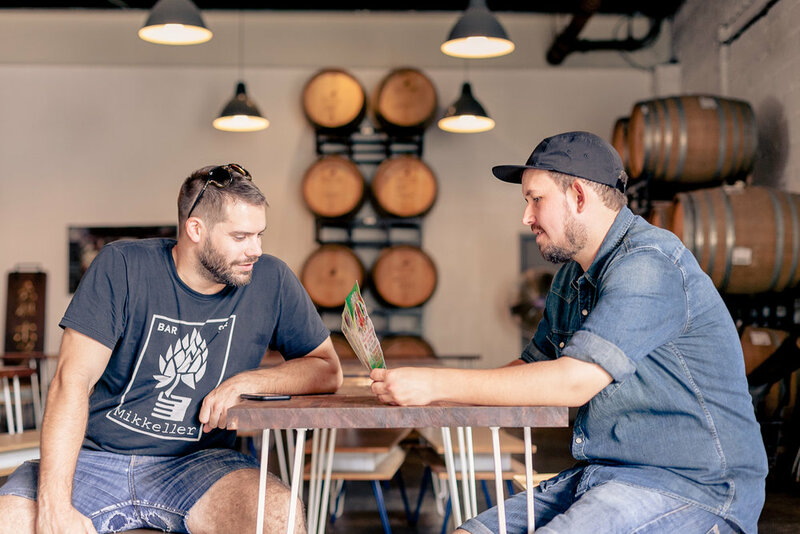 They also talk about the progress of each other’s respective breweries as Boera is currently working on a new farmhouse location. Larsen hits a wall. Many brewers are out of beer for the night, and lines are stretching 15-deep at the booths that still have liquid. We stand off to the side, sipping a Trillium Dialed In with Sauvignon Blanc. "I'm so tired, I'm not having fun," he says. The miles, the hours, and the days have finally caught up to him. He's spent. "I'm going to go get some air." Maybe a few minutes alone, underneath the dark Boston sky will help. We’re at Hojoko, a bar and restaurant connected to the hotel where most of the brewers are staying, winding down the night. Mercado from Brouwerij Lane greets us as we walk in. There are brewers and friends of brewers alike roving about the bar. The whole vibe is relaxed, guards letting down now that night one is on the books. Mercado goes to grab some beers, but when she returns, each of those beers has a shot of sake resting precariously on chopsticks above it. The night could get ugly. We load in and set up before the VIP portion of the first session. Everyone is tired from yesterday's session (not to mention the sake bombs). VIP at least means a slower start to the day, a mellow respite before the big crowds. I wander around and spy the gathering mass at the entrance. When the first wave of folks are let in, it’s a mad scramble to the Bokkereyder booth. You’d think these people were trying to be the first rider on a roller coaster at a theme park. He turns away for a few seconds, digging into his pockets, then holds his phone up to Andreas, the yellow screen of Untappd aglow with the positive review he’s just left. As Souvereyns walks away, a satisfied smile sneaks across Andreas' face. The final session begins. The sun sneaking through the old windows is gold and intense. We spend the last bit of this session mostly hanging behind the Alefarm booth, soaking in the remaining minutes of not only this festival, but the entirety of the week. Larsen pours a glass of his beer, still testing, still making sure it’s up to par. He’s due to fly back to Denmark the next day. I get the sense that he can’t wait. I ask if he’s anxious to get home to see not only his wife, but his two children. “We can’t talk about that” he says with a grin, but also a sense of seriousness. That he misses them is obvious. Ask him about his two little ones and you’ll get two things—a story, usually accompanied by an iphone photo, and a genuine smile. While his trip here has been nothing short of rewarding, the final boarding call for his flight home will undoubtedly be the best thing he’s heard in a week.